Controls all critical global settings of a the Joomla site, they include the following: Site, System, Server, Permissions, and Text filters. 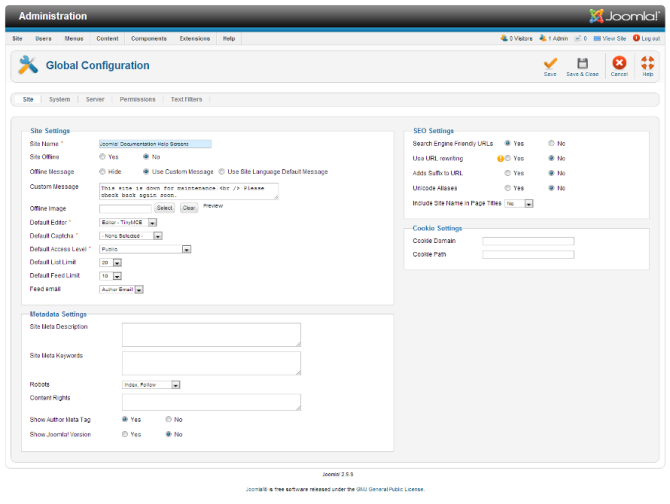 Select Site → Global Configuration from the drop-down menus. Offline Message. The message that will be displayed on the site when the site is offline. If custom message is selected then the message in the text area beneath is used. Offline Image. The image that will be displayed on the site when the site is offline. Default Editor. The default editor to use when creating articles. Default Captcha. The default Captcha to use when called by extensions. Remember to correctly configure the associated plugin when selecting an option here. By default, this is set to None. Default Access Level. The default access level to the site. The options here are from the Help25:Users Access Levels. Default List Limit. The length of lists in the Control Panel for all Users. By default, this is set to 20. Default Feed Limit. The number of content items to be shown in the feed(s). By default, this is set to 10. Feed Email. Newsfeeds include the authors e-mail address. Select Author Email to use each author's email address. Select Site Email to include the 'Mail From' email address for each article. Site Meta Description. This is the description of the site which is indexed by search engine spiders. Site Meta Keywords. These keywords describe the site and are the basis for improving the ability of search engine spiders ability to index the site. Content Rights. Describe what rights others have to use this content. Show Joomla! Version. It shows the Joomla! version in the generator meta tag. Search Engine Friendly URLs. When set to Yes, URLs are rewritten to be more friendly for search engine spiders. For example, the URL: www.example.com/index.php?option=com_content&view=etc..., would turn into: www.example.com/alias. Most of the items created in Joomla! have an Alias box where a search engine friendly URL can be inserted. The default setting is No. Adds Suffix to URL. When set to Yes, Joomla! will add .html to the end of the URLs. The default setting is No. Unicode aliases. If Yes, non-Latin characters are allowed in the alias (and URL). If No, a title that includes non-Latin characters will produce a default alias value of the current time and date (for example, "2012-12-31-17-54"). The default setting is No. Cookie Path. Path for which the cookie is valid. For this debug settings to work the associated plugin must be activated (this is enabled by default). You can also customize further what will show in the debug modes in this plugin. Administrator Only. SSL is only valid for the backend. Entire Site. SSL is valid for the whole site (front- & backend). Server Timezone. This tool sets the current date and time. The set time should be where the site's server is located. The default setting is (UTC 00:00) Western Europe Time, London, Lisbon, Casablanca. Host. The hostname where the database is located. It is typically set to localhost for most servers. It is possible for the hostname to be located on a different server all together. Database Username. The username to access the database. Database Name. The name of the database. From E-mail. The email address used by Joomla! to send site email. SMTP Security. Select the security model your SMTP server uses - Default is None. Options are SSL and TTL. SMTP Port. Most unsecure servers use port 25 and most secure servers use port 465. The permissions for each action are inherited from the level above in the permission hierarchy and from a group's parent group. Let's see how this works. The top level for this is the entire site. 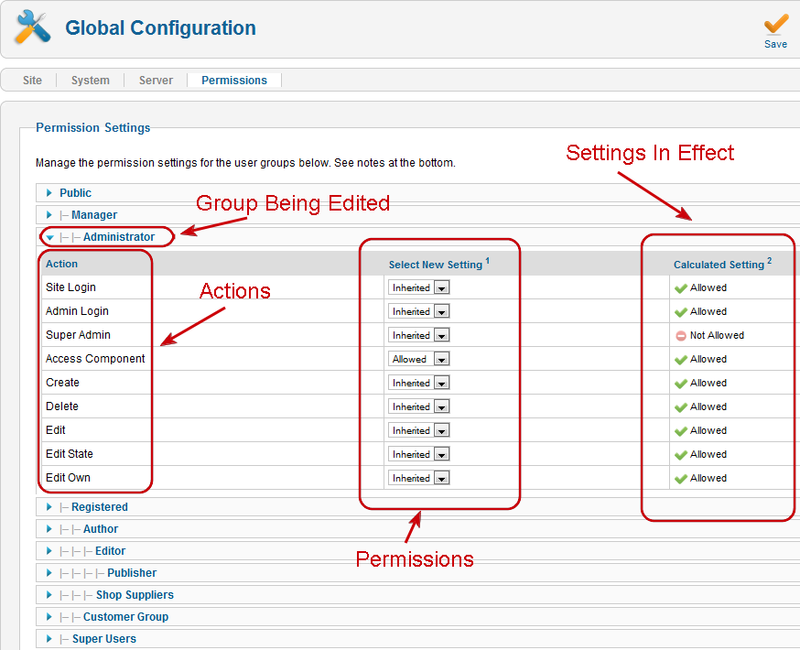 This is set up in the Site->Global Configuration->Permissions, as shown below. Web sites can be attacked by users entering in special HTML code. Filtering is a way to protect your Joomla web site. 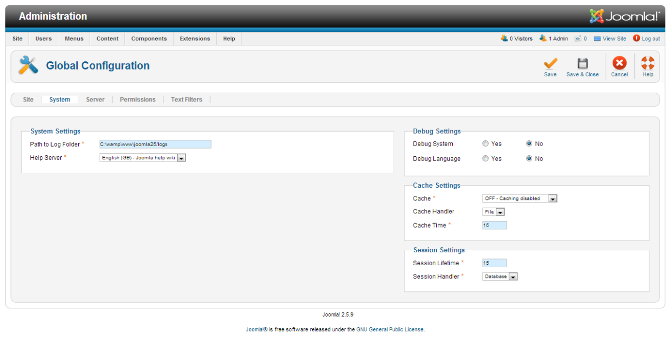 Filtering options give you more control over the HTML that your content providers are allowed to submit. You can be as strict or as liberal as you desire, depending on your site's needs. The default setting in Joomla version 2.5 is that all users will have "black list" filtering on by default. This is designed to protect against markup commonly associated with web site attacks. So, if you do not set any filtering options, all users will have "black list" filtering done using the default list of filtered items. If you create a filter here, this overrides the default, and the default filter is no longer in effect. 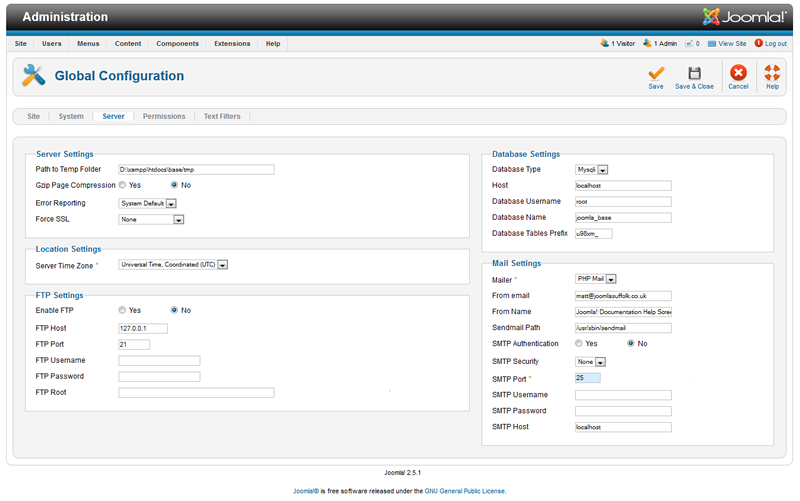 For each user group on your site you specify which filter is applied to their edits. The default filter is 'Default Black List'. 'applet', 'body', 'bgsound', 'base', 'basefont', 'embed', 'frame', 'frameset', 'head', 'html', 'id', 'iframe', 'ilayer', 'layer', 'link', 'meta', 'name', 'object', 'script', 'style', 'title', 'xml'. 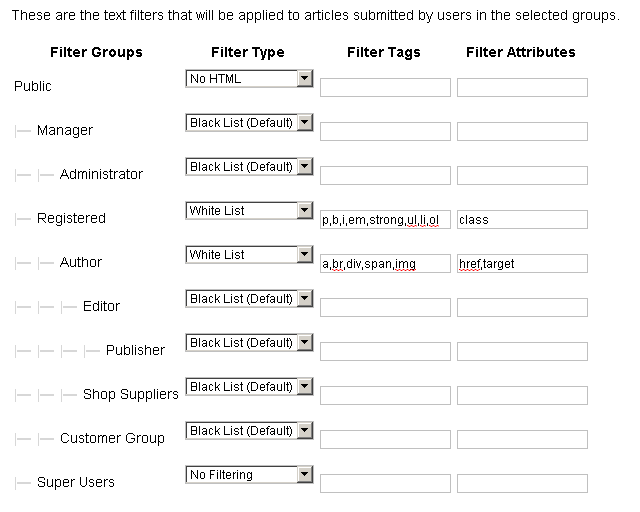 You can black list (disallow) additional tags and attributes using the Filter Tags and Filter Attributes columns. Custom Black List. Only those tags and attributes listed in the Filter Tags and Filter Attributes columns will be disallowed. White List. Only those tags and attributes listed in the Filter Tags and Filter Attributes columns will be allowed. No HTML. This is the strictest filter you can apply. All tags and attributes will be disallowed. No Filtering. This is the most permissive filter you can apply. All tags and attributes, including the default black list tags and attributes will be allowed. A list of tag names to add to the currently selected filter. Separate each tag name with a space or a comma. For the Default Black List filter these tags will be added to the default list of tags that are disallowed. For the Customer Black List filter these tags are the only ones that are disallowed. For the White List filter these are the only tags that are allowed. A list of attribute names to add to the currently selected filter. Separate each attribute name with a space or a comma. For the Default Black List filter these attributes will be added to the default list of attributes that are disallowed. For the Customer Black List filter these attributes are the only ones that are disallowed. For the White List filter these are the only attributes that are allowed. Combining filters. If a user belongs to two different groups that have different filter settings, filters will combine in a permissive way. That is, the set of tags the user will be permitted to use will the combination of the tags that each group allows the user to use. So if the user is a member of one group that white lists a specific set of tags and another group that white lists a different set of tags, the user will be able to use both sets of white listed tags. White lists override blacklists, so if a user belongs to one group that black lists a tag and another group that white lists a tag, the user will be able to use that tag. A user that belongs to a group that has no filtering will be able to use any HTML regardless of filtering settings for other groups the user belongs to. Filter Application. Please note that these settings work regardless of the editor that you are using. Even if you are using a WYSIWYG editor, the filtering settings may strip additional tags and attributes prior to saving information in the database. Developer note. The filtering parameters in config.xml have the new parameter menu="hide". This hides the filters from the Menu Item's Component pane as you do not want cascading overrides to occur at the menu item level. This page was last modified on 20 April 2013, at 19:46.